South Sudan’s violent conflicts continue to plague its people. An estimated four million South Sudanese have been forcibly displaced since December 2013, and more than a million have sought refuge in Uganda where communities have largely reassembled without their traditional or customary leaders. 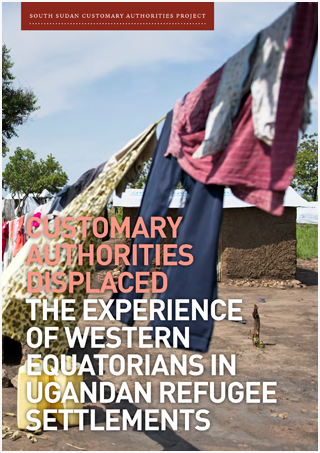 Customary Authorities Displaced examines the consequences of conflict and displacement on traditional forms of authority among refugees from former Western Equatoria state. Various forms of non-customary authority proliferate in these refugee settlements, in some ways filling the gap left by the missing chiefs. The report also explores discussions around the controversial reinstatement of the Zande kingdom among those living in refugee settlements. Support or opposition to the Zande Kingdom, and for stronger customary authorities more generally, share a key similarity: they offer people a means of articulating their present frustrations and future aspirations in a society that has been gravely affected by war.